Whew! This has been an eventful few months and I am sooooo ready for 2010!! Now that I am settled and 'reconnected with the world' I wanted to share some pics from the card showing I had in Alaska right before I moved. Other than my blog and the Cricut MB, this is the first time I've publicly shown my cards and the first time I've sold them. Overall, I think it went very well! 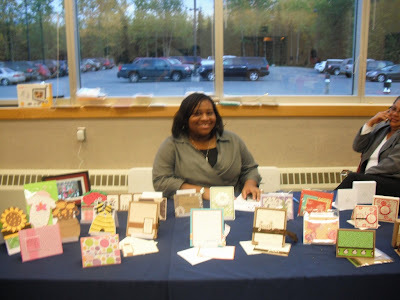 Me at my little table! Hi Everyone! 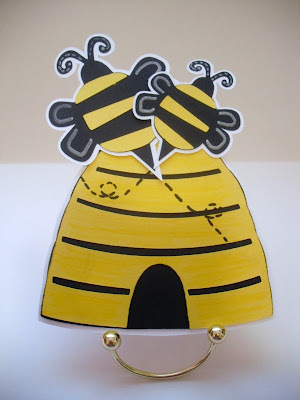 Thanks for all of the lovely compliments- so glad that the Beehive Card is such a hit! 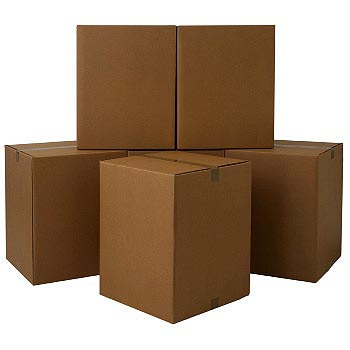 Sorry I've been so quiet- but I am in the middle of the BIG MOVE!! I am moving from Alaska to North Carolina. So I've packed up the Craft Room (so sad) and I'm enroute to the East Coast!!! I'm make sure I'll post when I get settled in! 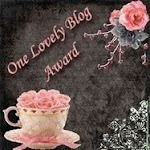 Thanks so much to Patsy Bocook for this blog award! I am so very excited! Thanks again Patsy! So I am *very* nervous about this, but I finally did my first tutorial! By friendly request, I demonstrated the Beehive spin-off of the flower pot card. Hope this helps anyone who was wondering how to put it together! Constructive comments on the tutorial are highly encouraged and more than welcome! Thanks! Here's another flower pot spin-off card! 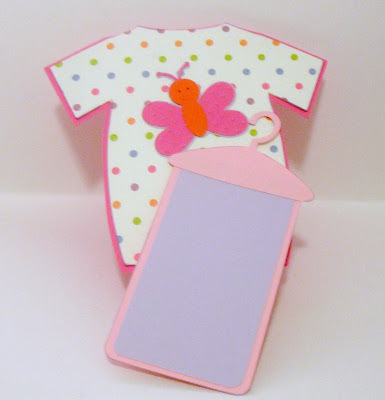 Using the New Arrivals cart, I created this onesie and the hanger comes right out of the top revealing the notecard. This card is so versitile- you can create any kind of card you want! I'll be making this in blue for one of my co-workers, so I'll be sure to post when I'm done! Working on the flower pot cards gave me some *major* inspiration! While I working on the sunflower- I thought to myself "if I can do this with a flower pot- why can't I do this with something else?!" I instantly started getting all sorts of ideas about all sorts of shapes! 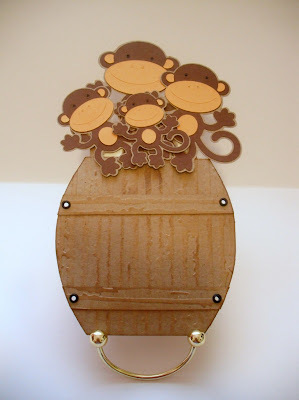 So here are two of my ideas that I have come up with so far- the beehive and the barrel of monkeys! I *can't wait* to see what else I can come up with! Now my only challenge if making the envelopes big enough...hmmm....LOL!! Once I find a project that I like- I really like to see how much I can do with it! 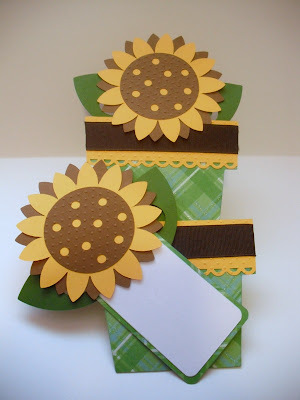 The flower pot cards are *great* and I can't believe that I waited so long to try them out!! 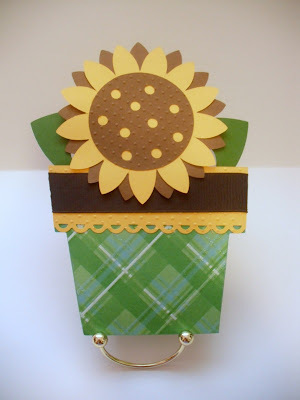 This is my second flower pot card and I wanted to do something different- so I went with a nice big sunflower. The Walk In My Garden cart is excellent for these cards and offers so much! I cut the flower pot at 4" using the blackout feature and then cut the sunflower (on shift) at 8 1/2" twice- once using blackout. To add dimension, I ran the middle of the flower through the Cuttlebug in the Swiss Dots folder. The leaves were cut at 2 1/2 and adhered to the back of the note card. So much fun!!! My mind is already churning around what else I can do with this project-- stay tuned!! Take the Cupcake for a Spin! I love spinner cards so I have to make one every once in a while! I wanted to do something really fun and light- so the Nana's Kids stack by DCWV really came in handy! 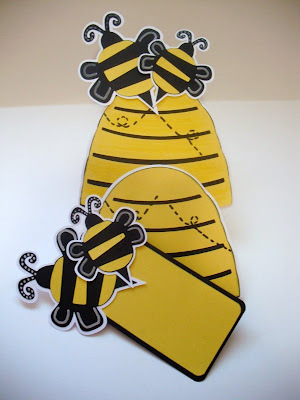 Spinner cards a fun and super easy to make and you can make just about anything spin! 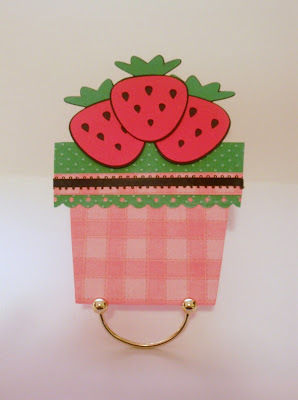 After seeing one on the Cricut message boards, I really wanted to make a flower pot card with strawberries in it! I had this picture in my mind of how I wanted it to look, but after making it using the instructions from Splitcoast, it seemed kinda small to me. So I decided to "cheat" and make the card using the flower pot on the Walk In My Garden cart. I wish I could remember who I saw do this card- but I give credit to whoever that person is!! The flower pot was cut at 4" using the blackout feature. 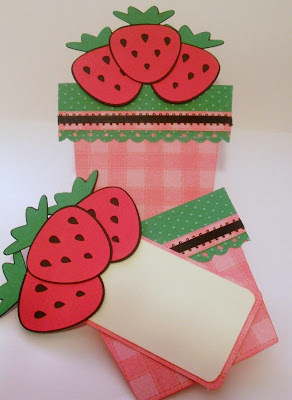 The strawberries are from Indie Art cut at 2 1/2" (using the shadow feature for the black cardstock). 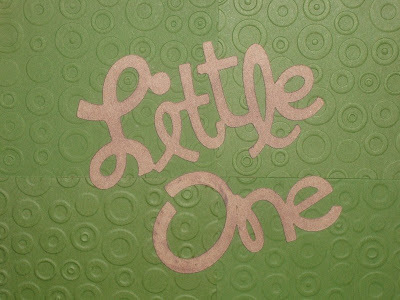 The green border was run through the Cuttlebug using the Swiss Dots folder and I lightly ran a White Cloud Dew Drop ink pad by Versa Mark over the dots to highlight them. Finally, the edge was punched using the Threading Water punch by Fiskers. The Home Accents Solutions cart has so many hidden gems! 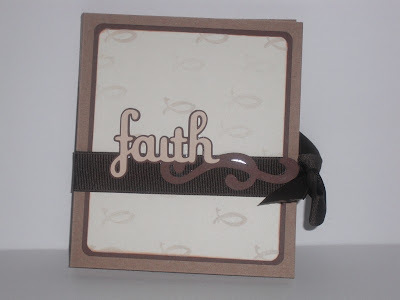 I have been wanting to use the 'faith' cut on that cart for a long time- but just couldn't think of how... 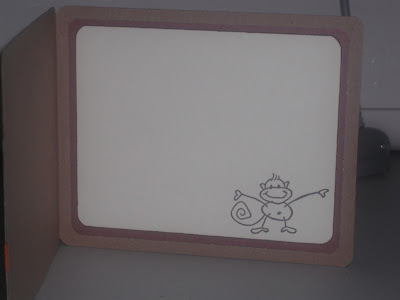 But now that I am on this Note Card Holder kick- the inspiration finally appeared!! Assembly was the most time consuming part of this project since the design is fairly simple. A little ribbon, a little inking on the edges, and a tiny bit of stamping completed this set! The ribbon was a $1 find at M's (gotta love that!) and the fish stamp came from J's. 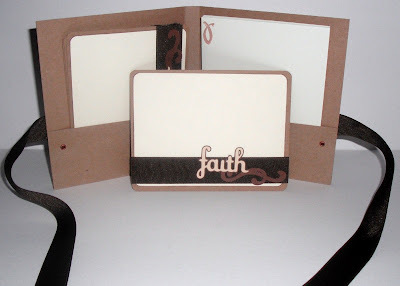 'Faith' was cut @ 1.25"- the bottom layer was cut using the shadow feature. My Corner Rounder punch by Fiskers added the finishing touches! What really made my life easier with this set was my recently acquired Xyron!! Being able to crank the ribbon and words through that little thing was a true time saver! I am sure that I will be using it much more in the future- especially since I plan to make quite a few more of these note card sets! 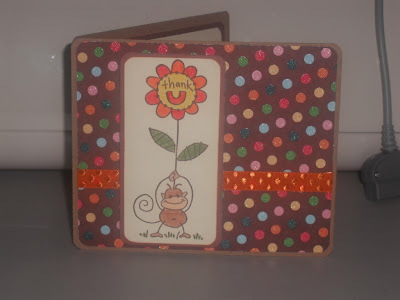 This is the second Note Card Holder set I have done! I decided I wanted to do something fun and upbeat - so flip-flops really filled that order! I bought the 3-D flip-flops from J's a while back and didn't really know what I wanted to do with them. Then I ran across a $1 Summer Fun clear stamp set at M's - I really can't resist those dollar deals! LOL! Finally- while at J's the other day I saw the flip-flop ribbon and I decided to grab it, as I remembered that I had the 3-D flops. So all of my little random pick-ups here and there truly came in handy for this set! Again- a *big thanks* to Dannie Graves for posting her tutorial- I am having a blast with this one!! 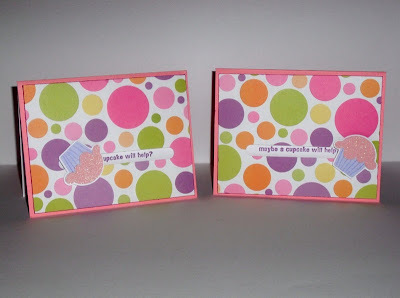 My First Note Card Holder Set! 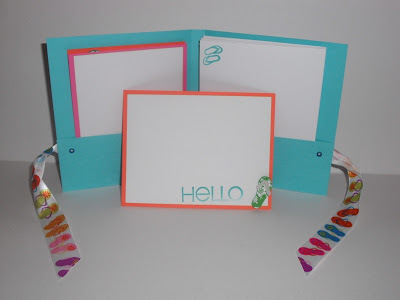 A *big thanks* to Dannie Graves for posting her YouTube tutorial on these great note card sets! When I watched I was immediately sold and have made 8 of these sets in the last 24 hours!! So I guess it's very fair to say that I am *totally hooked*! LOL! For my first set, I used my favorite Craft Paper made by The Paper Company and a nice stamp one of my co-workers just gave me. The sets come with four note cards and envelopes. 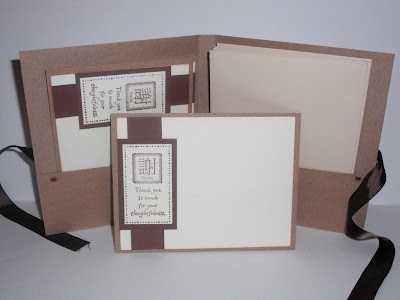 I made the envelopes using Plantin Schoolbook set at 5.25". This was fun and I have absolutely no doubt that I will be making many more of these sets!!! 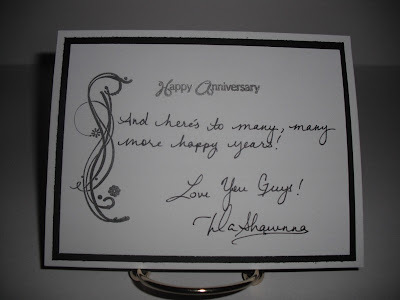 This is an anniversary card I made for my friends who just celebrated their very first anniversary! Yay! Keeping in line with my usual style, I kept it simple yet elegant. 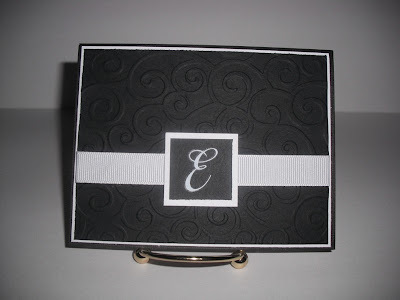 I matted and embossed the black cardstock on the front of the card using the Divine Swirls Cuttlebug folder. I wrapped the white ribbon around just the black card stock and then cut the squares for the monogram, which is a rub-on. Then, I did just a little bit of stamping on the inside using an Inkadinkado wedding clear stamp set. Wrote them a little note- and I was finished! Gift Set for the "Little One"
My friends are having a baby and I wanted to send a gift in style! And what better way to that to create the gift wrap set myself! LOL! 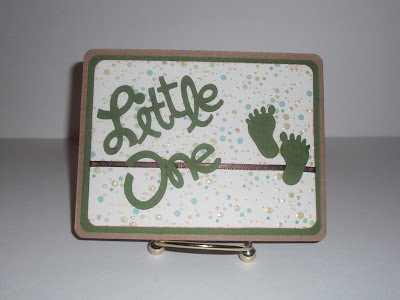 Using the New Arrivals cart, I cut the "Little One" phrase and the cute little feet to run a theme from the card to the bag. 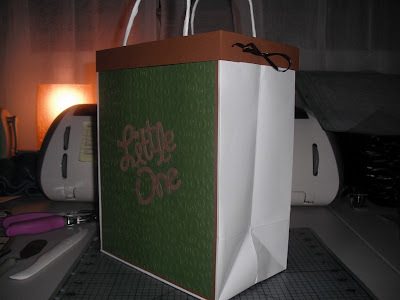 I'm not that great at gift wrapping, so I created a top for the gift bag and decorated it! I love the top for the gift bag and I think I'll be doing them of all of my gift bags from now on!! Even though I love love **love** making cards- my first love will always be cupcakes! I have always loved to bake, but I wanted to get better at decorating- so I took some Wilton classes at M's. The classes were *wonderful*, and I soon discovered that I really enjoy making individual treats for people to enjoy!! My style is really simple, but pretty and decadent; I really like to dress my cupcakes up so people feel like they are getting their own little fancy treat! The Drizzle Rich Cupcakes are the most requested and feature a buttery vanilla cake topped with chocolate icing (sadly I haven't mastered chocolate icing just yet :( so- Ms. Crocker does the j-o-b!). The pizazz comes when I drizzle smooth white chocolate over the milk chocolate and top it all off with melted caramel. Yum!!! Now, some might think that it's way too much, but they are usually pleasantly surprised - the cake is light enough that you really get to enjoy the chocolates and caramel without being overwhelmed!! My friend had a make-up party and wanted to do something simple and elegant to set the tone for the event. 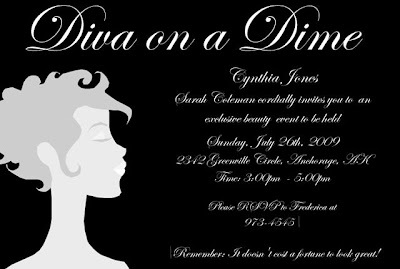 So I created individual custom invitations using a gray scale monochromatic color scheme. 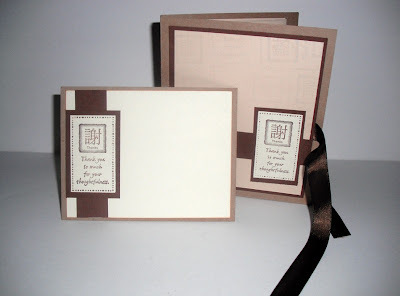 For the thank you card, we did the Joy Fold card in the same color scheme. 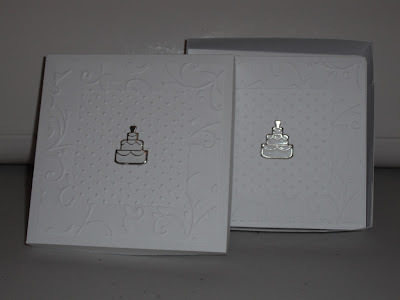 For the embossing, we used the Divine Swirls Cuttlebug folder. Instead of the traditional Joy Fold closure, we used ribbon delicately knotted in the middle. For the favors, I made the 2-5-7-10 box. This was an incredible easy box to make and I love that you can make it with just one sheet of 8.5 X 11 paper. While making the box, I noticed that I could fold it small enough to fit into a Cuttlebug folder, so just experimenting, I decided to emboss the entire box before I assembled it - and I loved how it turned out! A quick 60 second assembly followed by some sheer ribbon- and it was done! The party turned out great- everyone had a fabulous time! Since I moved back to Alaska, I have become hooked on paper crafting & I really wanted to participate in a craft day. Fortunately for me- I wasn't the only one! So last weekend, 6 of us got together for our very first "Crafty Saturday"! It was so much fun! Everyone came with projects to work on and some of us did demos of various Cricut & Cuttlebug techniques. We also bought snacks, but we were having so much fun- we almost forgot to eat!! At the end of the day, we decided that since we had such a great time- we are going to do it every month! I can't wait until next month!! So-- here are some pics from our first "Crafty Saturday"! Kind of a random shot- but this was my work area! LOL! 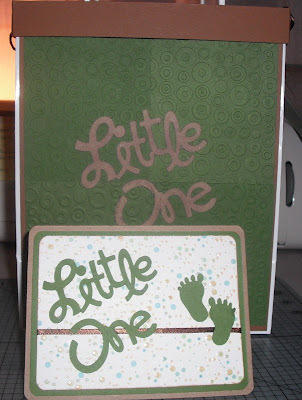 Shameka was a total newbie to crafting- and these are her first two cards! She did a fabulous job!! 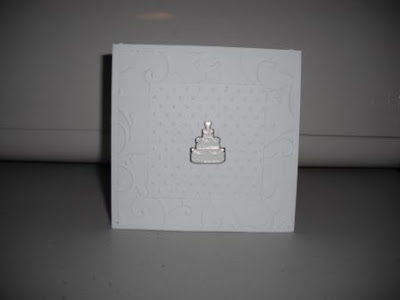 This is one of Debbie's projects- a really cute birthday card! Great colors! 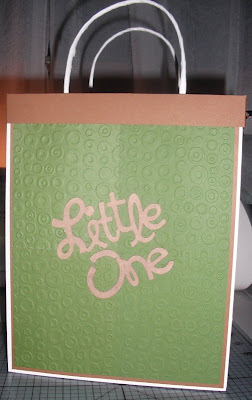 Frederica showed how to create wall art using Provo Craft Vinyl and the new Stand & Salute cart! She's a pro at this! 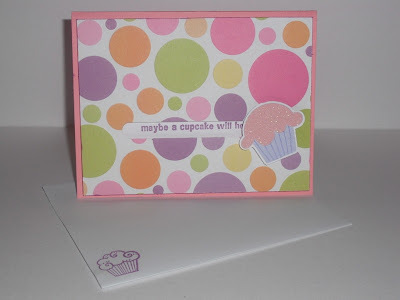 Gracey created a wonderful birthday card using the cutest layered cupcake! Loving the birthday theme going on! Lyn made some excellent sea-inspired note cards for her mom! Her mom's going to love them! In the midst of all of my picture taking- I worked on a couple of projects as well! 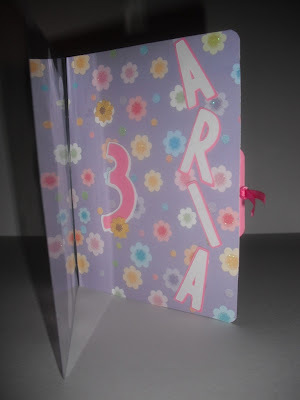 I created this card for one of my little friends who was turning 3!! 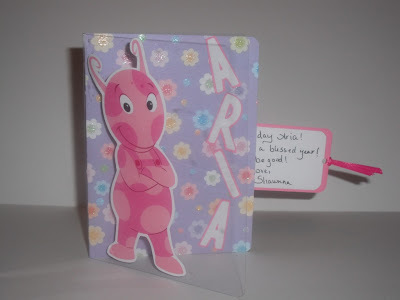 She loves the Backyardigans so with the help of nickjr.com I put together this little card for her. Whenever I use a ShortCuts as a card base, I can never bring myself to write on the inside of the card (lol) so I usually make a little insert that slides in/out of the side/bottom of the card. I hope this likes it! My First Glass Etching Project! 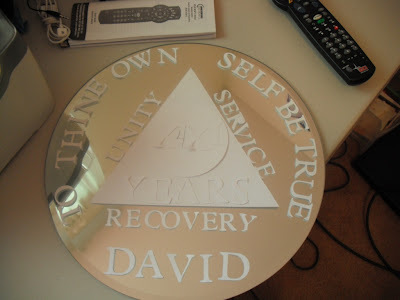 For this project I used a 16" beveled mirror I got from M's. 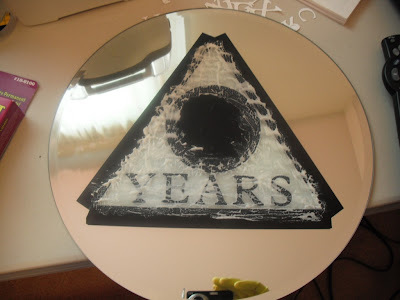 To ensure correct sizing, I cut and recorded the sizes of all the letters and shapes and placed them on the mirror. Then I cut the words and shapes using ProvoCraft vinyl. To assemble the triangle, I used strips of vinyl. Finally, working from the inside out, going layer by layer, I etched all of the elements. 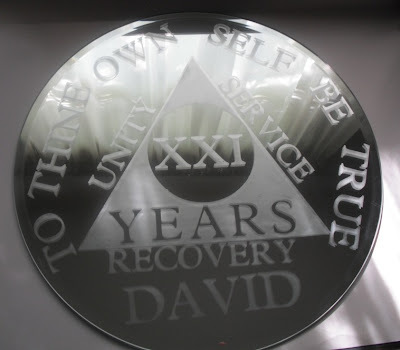 When the entire project was complete, I used glass cleaner to remove all watermark, fingerprints, etc. All in all- it was pretty easy project after I got everything layed out- the more elements you have the more time consuming your project is going to be. Etching is super simple! I look forward to more projects!!! 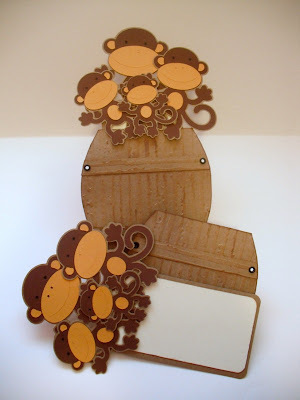 A Different Take on the Same Little Monkey! One of my co-workers requested a thank you card for her doctor. Her doc is a male, so I wanted to stay away from anything too frilly. And since I really *love* Changito (smile!) I thought- why not do a different take on the 'Thank U' stamp? So this is what I came up with! 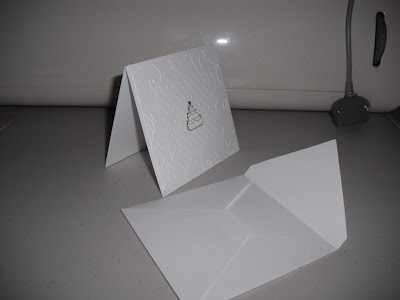 This was a card I did for the embossing challenge over on the Sistah's Blog. I had bought a wedding stamp set (on sale!!) by Inkadinkado I had been eyeing for a while and my friend had also just announced her engagement so--why not make a card with some embossing?! 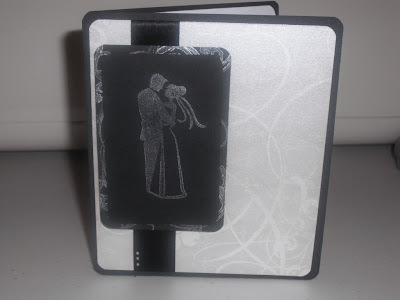 To create the background the image of the couple is on, I stamped and embossed a really pretty swirl from the wedding set. I also embossed the image of the couple. 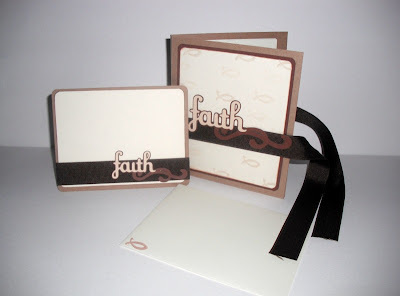 These little cards were designed to be the perfect compliment to any wedding gift wrapping. I found the cake brads at Michael's and thought they were really adorable- just wasn't sure what I would do with them.... Then I came up with idea and decided to make a set of them with a box!!! So excited about my little box! I think I might give these away as a gift. After all- it is wedding season!